One summer, as young Clee finds herself lost in the shuffle with the arrival of a new baby brother, Uncle Fishtank Hal comes to the rescue when he asks her to care for his special southern-breed turtle. For Clee, caring for the turtle is like therapy to cope with the new changes in her life. That is until the turtle dies due to the harsh cold winter and Clee is forced to bury him out in the yard. Without the turtle, Clee spends time with her new brother and learns to enjoys his company. In spring however, the turtle springs back to like in the compost pile and Clee gains a new outlook on the changes in her life. 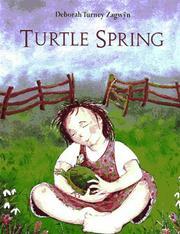 Zagwyn, Deborah Turney, “Turtle spring,” Children's Picture Book Database at Miami University, accessed April 26, 2019, https://dlp.lib.miamioh.edu/picturebook/items/show/9086.